It is nightfall in ancient Achaea, and your goat-herding family and neighbors gather near a fire to hear a traveling minstrel sing of the fall of heroes. Or perhaps you are a citizen in the Athenian city-state, listening indoors to the foibles of the gods, so like those of your own aristocracy. Or perhaps you dwell on Leuce Island in the Black Sea, and you long for a paean to menein, a word that means rage and that is reserved for the gods alone, save one mortal, the hero patron of the cult you worship, Achilles. But always you expect the minstrel to sing of that distant city: Troy. Squeeze nickel through that rush of Greekoid scum! And ran her finger down his spine. Run to the Fleet. Give Wondersulk our news. His love is dead. His armour gone. And clarify his wounds with mountain water. Before whose memory the stones shall fade. A modern reader would be no less astounded by Christopher Logue’s War Music: An Account of the Iliad than would those ancient Greek audiences. It is one of the most important works of literature of our time, a loose translation of the Iliad that Logue began in 1959 and published piecemeal in a number of different editions (Kings, The Husbands, All Day Permanent Red, Cold Calls, War Music, and the planned but incomplete Big Men Falling a Long Way, which the editor Christopher Reid has carefully reconstructed from the manuscripts and notes Logue left at his death in 2011). Dare not sport its beam. King Agamemnon views Troy’s skyline. The Queen of Love, Our Lady Aphrodite. (Casting possibilities: Kate Upton, Anita Ekberg.) Logue never lets us forget that the gods are ever-present in our lives: "Dawn stepped barefooted from her lover’s bed / And shared her beauty with the gods, / Who are as then; and with ourselves, as now." Him making for the rise topped by Prince Hector’s vulture plume. and we hear it in the noise of battle: "And dear my God, the noise! / As if the hides from which 10,000 shields were made / Came back to life and bellowed all at once." Logue hyperbolizes the grotesquerie of battle with images of horrifying brutality, like the mounting of Nyro’s bell-braided head atop a spear in a parody of the jester’s marotte, and with one-liners worthy of a 1980s Schwarzenegger film, as when the trumpeter Teléspiax takes an arrow to the head that was meant for Hector and says, "My Prince, your trumpeter has lost his breath," or when Aphrodite complains to Zeus about the wound she received from Diomedes: "Human strikes God! Communism! The end of everything!" Over their covert’s mossy heights. Moments like these absolve the needs dividing men. That war was meaningful, because they lost their friends. Somehow it sounds like Hector. With Death’s voice coming out of it. Down on your knees, Achilles. Further down. Trowel up its dogshit with your mouth. And Logue captures the sheer hatred fueling Achilles’ revenge when he depicts him staring at the divinely-forged armor his mother, the Nereid Thetis, has brought him: "Slitting his eyes against the flare, some said, / But others thought the hatred shuttered by his lids / Made him protect the metal." Logue’s death in 2011 left War Music unfinished, and some scenes that readers of Homer most appreciate and use to judge the translator’s art are missing, including the warm family interaction between Hector, his wife Andromache, and their infant son Astyanax (who ultimately will be thrown from the ramparts by Achilles’ son Neoptolemus, his mother taken as Neoptolemus’ slave); Achilles’s defiant address to Hector, when he tells him "There can be no covenants between lions and men"; and the culminating fight, when Achilles slays Hector and seals his own fate. The hands that killed his son. 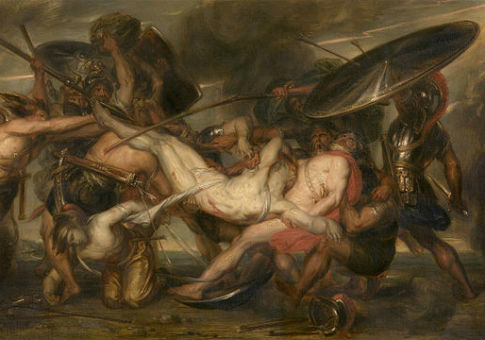 Logue’s death also prevented him from composing the famous description of Achilles’ shield. But Reid supplies us with Logue’s tantalizing note, in which he described his plans: "Homer describes the creation in Heaven of a new shield […] The new shield’s face is covered with designs that show the world as Homer knew it. This passage will be extended. The pictures on the shield will reflect our world." No minstrel would ever tell the whole Iliad in one sitting, and so Logue’s abrupt departure connects us once more with those ancient audiences. We will never have the vision of a shield reflecting Achilles’ world and ours. But in another way, we do have it, we have Logue’s War Music, and by staring into its unfinished yet gleaming surface, we glimpse past, present, and future at once. Like Achilles with his armor, we can stare into "the holy tungsten like a star."